No other monument has created so much intrigue other that these feats of engineering that we still couldn’t reproduce to this day. These pyramids displays nearly perfect symmetry and were constructed around 2560 BC, taking an estimated 20 years to finish. It stands as a symbol to the mysteries of ancient man and remained the tallest building in the world until the Lincoln cathedral was constructed in 1311. 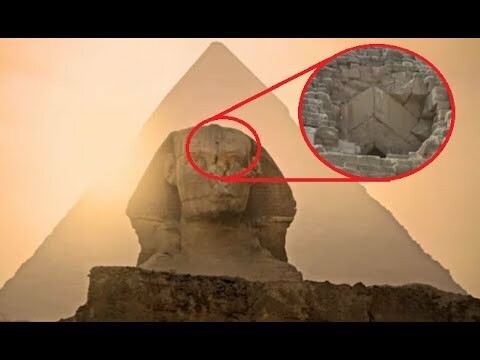 The pyramids are not just like lego structures with blocks stacked up on top of eachother. There are chambers, air shafts, the king’s chamber, queens chamber, various other passageways and even a subterranean chamber.The granite stones in the King’s Chamber in the Great pyramid weigh up to 80 tons, and were somehow transported over 500 miles, without the help of the wheel or metal tools. However one of the biggest mysteries about the pyramids is what’s known as the big void which is basically like a large empty cavity above the grand gallery. Since it’s not easy to access, no one knows exactly what’s inside. Japanese and French scientists confirmed its existence by using various methods including radiography, gas detectors, and nuclear emulsion films. Some theorize it was just a gap that helped reduce the amount of resources needed for construction, while others believe it could contain answers that we’ve been looking for. Archaeologists discovered a rare funerary boat near the Abusir Pyramids, located just south of Cairo. Since the Nile gave ancient Egypt many of their resources, boats played a vital role for transportation and fishing to the civilization. With egyptians taking their burial ceremonies quite seriously, there’s no doubt that’d they want to bring a boat with them to the afterlife. The discovery of the 4500 year old ship most likely belonged to an upper class citizen since timber wasn’t always that easy to get in the desert at this time. The archaeologists were clearing an ancient mastaba, or tombs, and found parts of the 60 foot ship lying in the bed of stones. This could be key in further understanding the Egyptians ship building techniques as well as funerary traditions. 2. We’re the Pyramids a Power Plant? Could the real reasons the pyramids were built be hidden in history so we don’t revert unlimited energy sources? Could corporations or elite families be suppressing a cheap way to gather power so that we have to rely on their sources of energy? Would thousands workers spend years building a massive tomb, or could there be some other reason they don’t want us to know about. Recent studies have shown that the great pyramid in giza have shown that the internal chambers are actually capable of concentrating electromagnetic energy under the base. Tesla often felt as though this was a possibly theory and took this consideration when he conducted his own work. The top of pyramid is also missing a capstone which some feel as though is necessary for tapping into the cosmic powers of the building. People are banned from climbing to the top but a man named siemens claimed to have notices a mysterious electrical power while being there.